A first experience for Little Miss A today as we went to a trampoline park. Little Miss A used to love the trampolines at the Gym she used to go to in Aylesbury so we've been wanting to take her to a trampoline park for a while. We now have quite a few around us to choose from here in Cheshire. The good thing is that they all have Parent Toddler sessions. 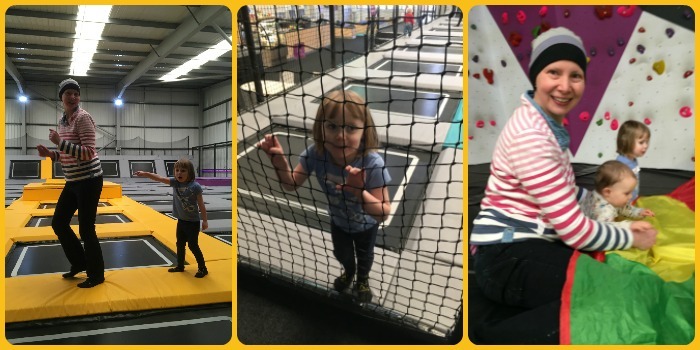 Today we tried the UA Toddler session at Urban Air Cheshire in Winsford. The session runs from 10.15am - 12pm so it's a good, long session. Everyone has to watch the safety video and then it's time to bounce! There is plenty of opportunity to just jump around and then at intervals the UA instructors get the kids active with lots of games. Little Miss A's favourite was 'What's the time Mr Wolf?'. Most of the games are on the trampolines but there was a bit of time off them for some play time with a parachute. Baby R enjoyed getting involved with this bit! 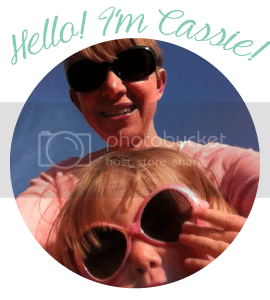 The session is just £4.95 per child with one parent/guardian free. You have to purchase a pair of special socks but these can be used again for future visits. The session is really good value considering you get over an hour and a half bounce time, plus there's a break for a free squash and biscuits for the kids. The session is exclusive, just for kids so no danger of them getting bumped into by larger kids or other adults. It's really great that parents can go on the trampolines with their child. Thankfully Little Miss A was equally happy to bounce a bit on her own and with the instructors so I could have a rest. It's been a long time since I've been on a trampoline but it is great fun. I definitely burnt a few calories! It is worth finding out if your nearest trampoline park has a toddler session and giving it a go. It's a great way for toddlers to burn off a whole lot of energy! 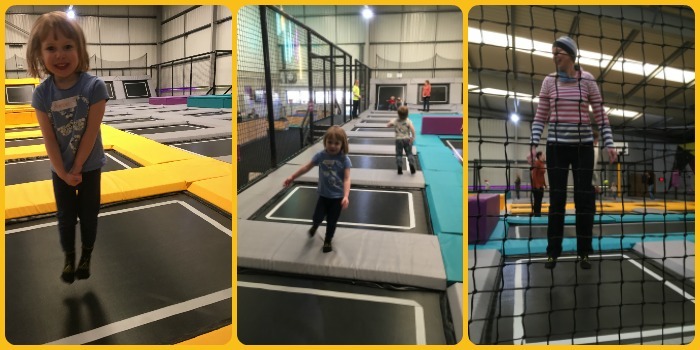 The pricing does seem to vary greatly between the different parks, but the session at Urban Air Cheshire is fantastic value for money. Little Miss A is already talking about the next time we go. I can't decide if it's a good idea or madness to offer toddlers a juice and biscuit break and then get them back trampolining!! Thanks for joining #daysoutwithatoddler! See you again next month! It was a really fun session and definitely made more enjoyable with the games as well as time just to bounce.